An overwhelming 79 percent of voters say parents should be required to have their children vaccinated before attending school, regardless of the parents’ religious beliefs. Voters continue to support making the two-percent property tax cap permanent, legalizing recreational use of marijuana, and eliminating monetary bail for misdemeanors and non-violent felonies. 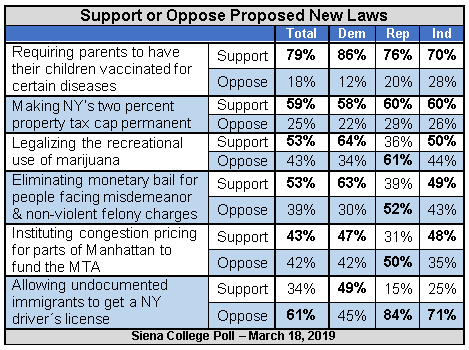 They are split on congestion pricing, and by a nearly two-to-one margin, they oppose allowing undocumented immigrants to get a New York driver’s license. “Four out of five voters say that parents – regardless of their religious beliefs – should be required to have their children vaccinated for measles and other diseases before they can attend school. The ‘weakest’ support is among independents, who support it 70-28 percent,” Greenberg said. “Making permanent the property tax cap has strong support from every party and every region,” Greenberg said. “Eliminating monetary bail and legalizing recreational marijuana are both strongly supported by Democrats, opposed by Republicans and receive tepid independent support. Congestion pricing, which was strongly supported in January, is now break-even. 51-41 percent, up from 47-46 percent. 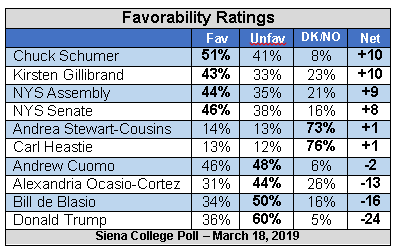 “Cuomo saw his favorability rating tick up to near break-even, up from the lowest favorability rating he ever had. His job performance rating, negative 38-61 percent, also moved up a little, although it remains significantly below water,” Greenberg said. “Both houses of the Legislature also saw small jumps in their favorability ratings and both are in positive territory by high single digits. “While Democrats disagree, a strong majority of independents and an overwhelming majority of Republicans say that Democratic control of the Governor’s mansion and both houses of the Legislature are moving the state too far to the left,” Greenberg said. “Two-thirds of voters – including a majority of Democrats – say that Democratic control of the state makes it harder for businesses to be successful. 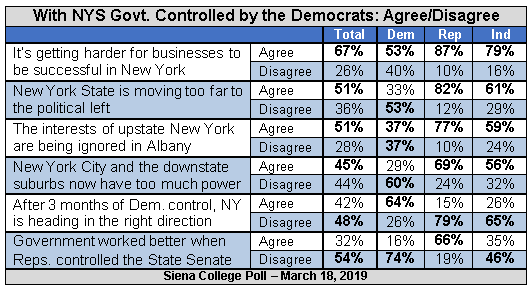 This Siena College Poll was conducted March 10-14, 2019 by telephone calls conducted in English to 700 New York State registered voters. Respondent sampling was initiated by asking for the youngest male in the household. It has an overall margin of error of +/- 4.2 percentage points including the design effects resulting from weighting. Sampling was conducted via a stratified dual frame probability sample of landline and cell phone telephone numbers (both from Survey Sampling International) from within New York State. Data was statistically adjusted by age, party by region, and gender to ensure representativeness. 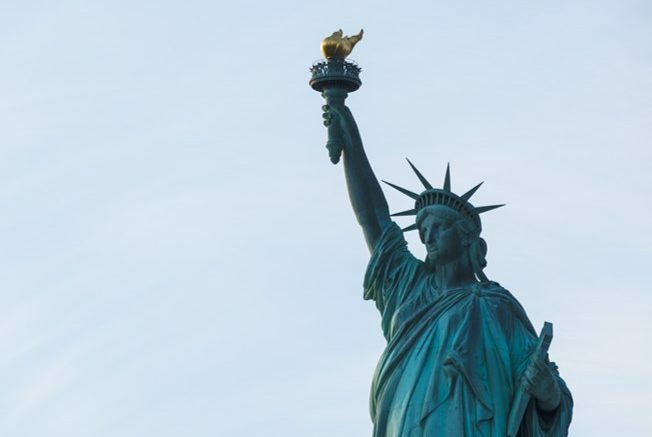 The Siena College Research Institute, directed by Donald Levy, Ph.D., conducts political, economic, social and cultural research primarily in NYS. SCRI, an independent, non-partisan research institute, subscribes to the American Association of Public Opinion Research Code of Professional Ethics and Practices. For more information, call Steve Greenberg at (518) 469-9858. For survey cross-tabs: www.Siena.edu/SCRI/SNY.